Textures/Kai/3r_metpan01        // Material definitions start with the material name. diffusemap  Textures/Kai/3r_metpan01_diff.png     // This line says which texture is used as diffuse-map. A texture map specification starts with a keyword (e.g. diffusemap) and is followed by a “map composition”. Map compositions are normally just the path plus file name of a texture image relative to the MOD directory, like for example Textures/Kai/3r_metpan01_diff.png. However, map compositions can also be more complex constructs as explained in the next section Map Compositions. The initial keyword (diffusemap etc.) defines how the texture image is used in dynamic lighting computations during rendering. This is very similar to Doom3 materials, and both Cafu and Doom3 implement in this regard a form of the Phong lighting model. diffusemap The texture map image that defines the diffuse color (or diffuse reflectivity) of the material. The alpha channel of the diffuse-map specifies the translucency of the material. normalmap The texture map image that specifies the color-encoded normal-map of the materials surface. The normal vectors must be specified in tangent space, range compressed (-1 to 1 maps to 0 to 1), and the y-axis points top-down. Note that heightmaps can be converted into normal-maps as described in section Map Compositions below. specularmap The image for the materials specular highlights. lumamap This texture map image defines the luminance for this material. Note that the light emittance that is defined here is local only (as is a general property of the Phong lighting model). It is not cast onto other surfaces. lightmap This materials lightmap image. This image is normally computed and provided by the Cafu engine or the program (e.g. the material viewer or CaWE) with which you use the material. Although you can provide texture map file names as with the above keywords, that rarely ever makes sense. Normally, simply specify the special lightmap $lightmap in combination with the lightmap keyword in order to use whatever lightmap the Cafu engine provides for this material. This is demonstrated in the preceding example. If you don't use this keyword at all, or specify something different than $lightmap, the compile tools will not cover surfaces that use this material with a lightmap, and these surfaces will neither receive nor reflect Radiosity light. Note that for many effect materials, this is desired and very useful behaviour, as for example with decals, skies, water surfaces etc. shlmap The image that contains color-encoded coefficients for Spherical Harmonic Lighting for this material. As for lightmaps, you may specify arbitrary texture map file names with this keyword, but normally just use $shlmap in order to let the engine supply the proper SHL map. This example has keywords and elements that will be explained further below, but for now observe that the file name that is assigned to the cube-map is Textures/SkyDomes/PK_BrightDay2#.png. When the Material System loads the six individual images from disk, it will therefore load them from the files Textures/SkyDomes/PK_BrightDay2_px.png, Textures/SkyDomes/PK_BrightDay2_nx.png, Textures/SkyDomes/PK_BrightDay2_py.png, and so on. cubeMap2 This is like the above cubeMap keyword. It allows you to specify a second cube-map for special-purpose shaders that require two cube-maps. This keyword too is normally ignored unless a shader is specified that makes use of it. See Shader Specifications for more details. You can specify arbitrary combinations of these keywords in one material, as only the diffusemap keyword is mandatory. However, if you use the same keyword more than once, only the last occurrence is considered. The order of the keywords occurrences is not relevant. The expressions that are valid to define a map composition are defined as follows. Please note that the arbitrary nesting of expressions is expressly permitted, yielding great freedom for artists. filename This is the most simple expression: a path plus a filename, as e.g. Textures/Kai/barrel_rst_diff.png in the above example for the diffusemap. The path is relative to the directory of the MOD for which this material script was written. Supported file extensions include png, tga, jpg and bmp. add(e1, e2) This expression adds the colors of e1 and e2, where e1 and e2 can be arbitrary sub-expressions. The resulting RGBA values are clamped to 1.0.
mul(e1, e2) This expression multiplies/modulates/filters the colors of e1 and e2. hm2nm(e1, scale) Assumes that e1 is a gray-scale heightmap and converts it into a normal-map. The relative height of the heightmap is scaled by factor scale in order to weaken or pronounce the resulting effect. Values between 1.0 and 10.0 are normal use, but numbers greater than 10.0, less than 1.0, or even negative numbers are allowed, too. flipNMyAxis(e1) Considers the colors of e1 as color compressed normal-vectors, and flips their y-component. This is useful for normal-maps that have their y-component pointing into the wrong direction. Such normal-maps occurred in the early days of dynamic lighting or were created for other programs than Cafu. This function is for fixing such cases, and should rarely be needed. renormalize(e1) Considers the colors of e1 as color compressed normal-vectors, and renormalizes them (scales them to unit length). This is mostly useful for testing and debugging. blue2alpha(e1) This function is for use with old diffuse-maps. It replaces the alpha channel of e1 with value 0.0 (transparent) if the RGB color at this pixel is pure blue (0.0, 0.0, 1.0), and 1.0 (opaque) otherwise. Moreover, pure blue pixels are replaced with the average pixel color of the non-blue pixels in order to account for texture filtering. (automatic scaling) Whenever you employ one of the above expressions to combine the results of two expressions e1 and e2 that have different lateral dimensions, e2 is automatically scaled to match the size of e1. You can apply map composition expressions to all above mentioned texture map specification keywords, i.e. they work with diffusemap, normalmap, specularmap, cubemap, etc. Technically, a map composition is completed before the Cafu engine or the graphics board see them. In other words, the engine or the 3D hardware never see the individual images, only the composite result. Everything that is done by these composition steps could also be pre-worked by the artist in an image processing software. There would be no difference for the engine, the hardware, or in the resource (memory) consumption. Note that this feature has nothing to do with dynamic lighting or how a texture map image is combined with images of other texture map specification keywords! repeat for repeating the texture in horizontal direction. This is the default. clamp for clamping the texture in horizontal direction, taking the border color into account. As the Cafu MatSys never uses or sets the border color, using clamp is rarely ever useful. clampToEdge for clamping the texture in horizontal direction to its edge color. Often useful with cube-maps or terrain base images. repeat for repeating the texture in vertical direction. This is the default. clamp for clamping the texture in vertical direction, taking the border color into account. As the Cafu MatSys never uses or sets the border color, using clamp is rarely ever useful. clampToEdge for clamping the texture in vertical direction to its edge color. Often useful with cube-maps or terrain base images. noScaleDown specifies that the texture image is never scaled down, not even if the user selects a medium or low texture detail setting for tuning the graphics performance. Useful for fonts, HUDs, lightmaps (implicitly), some model textures (see example below), and everything else that must not get mixed up or blurred by image filtering. Also used e.g. for the Cafu splash screen logo, which would get blurred otherwise (look into Games/DeathMatch/Materials/Splash.cmat if you want to toy around with it a little ). noCompression exempts this texture image from being stored in a compressed format in video memory, even if the user generally enabled texture compression for tuning the graphics performance. 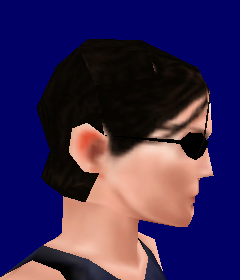 In the Cafu engine, texture compression is by default enabled for all texture images except normal-maps. Although Cafu automatically selects and employs the latest and highest quality compression method that the graphics driver offers (this even works when the Cafu executable is older than the driver! ), sometimes the compression process comes with some loss of image detail or introduces small artifacts. noCompression can then be used to ensure no compression for a particular texture. useCompression is more or less the opposite of noCompression: it turns compression back on. Normally there is no reason to ever use this keyword. It exits for symmetry to noCompression and because noCompression is the default for normal-maps: if you want to have compression enabled for a particular normal-map, specifying useCompression will turn it on. However, please note that compression artifacts in normal-maps tend to disturb the lighting computations so much that the generated output images drop to questionable quality. Also note that useCompression is “weak”: If the user generally disables all compression, it will have no effect. The meaning of the minFilter, magFilter, wrapS and wrapT options is analogous to their respective meanings in the OpenGL and DirectX APIs. The OpenGL Programming Guide (the “Red Book”) about OpenGL version 1.2 and higher has a good explanation about these options. Although the text is specific to OpenGL, the same concepts apply to the above mentioned options. The “Red Book” for version 1.1 does not address the clampToEdge option, but its text is available online at http://www.rush3d.com/reference/opengl-redbook-1.1/chapter09.html. The options noScaleDown and minFilter bilinear are often combined, because both scaling down textures for better graphics performance as well as using trilinear filtering for rendering have a tendency to mix the colors of neighboring pixels. In some cases such as font textures, even the bilinear filtering is too much mix-up, requiring us to combine noScaleDown with minFilter nearest. Another example for the noScaleDown and minFilter keywords. This is a typical skin texture that a modeller has produced for application to one of his model meshes. The image to the left shows the result of the this material definition being applied to a model mesh. 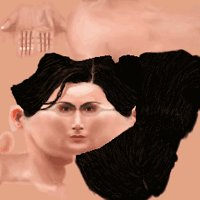 Notice the small glitch in the image, which is a result of mipmaps being applied to the above shown texture: Mip-mapping mixes black pixels of the hair with adjacent, bright pixels of the skin, yielding the intermediate colors that are marked in the result image to the left. Such glitches are even more disturbing and better visible with animated models, e.g. when the head of the model slightly turns. Note that these kinds of artifacts are no bugs, they are a normal result from mipmap filtering.